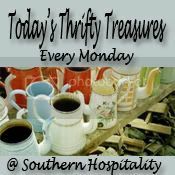 I am going to highlight some of my finds that I used in my "Blue Creek Chic Laundry Room Reveal" post from last week for "Today's Thrifty Treasures" hosted by Rhoda at "Southern Hospitality". Make sure you visit her for more weekend treasures. I purchased this wonderful jug with the white wicker for $12.00. The wooden shoe form was only $4.00, and the wire locker basket with that "gotta have" number on it was $16.00. 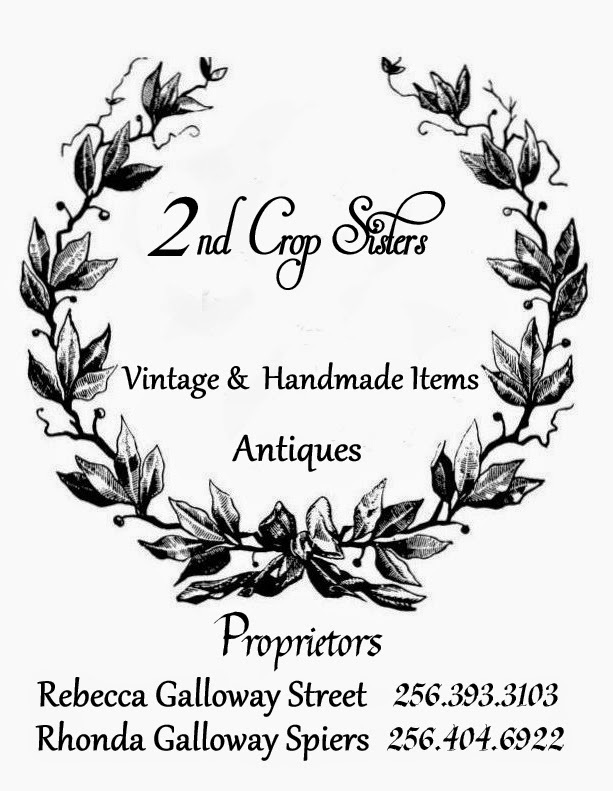 They were all purchased at "Angels Antique & Flea Mall" in Opelika, AL. This wire basket also came from Angels and cost $12.00. I purchased the old green glass jug from "Long Leaf Antique Mall" in Alexander City, AL for $2.00!! That was my cheap find for that day. I enjoy shopping at both of these places!!! Just for fun, I put a tap light behind the wire basket. The old geen jug was so pretty all lit up! This project is very dear to my heart. These are George and Martha Washington paper dolls that I played with as a child. My sister, who is two years older than me, was my paper doll buddy, so we divided the Washington family. I wanted to enjoy them, so I put them in a shadow box from Hobby Lobby. I used archival sticky dots to secure them. I am delighted with the way they look, but mostly I love the "flashback" to my childhood that I get when I see them. For more "Metamorphosis Monday" projects, visit Susan at "Between Naps on the Porch". I love this post! You really got some great deals. I especially love the wire basket! I too love wicker and paper dolls, so this was a great post for me to read. Everything looks so wonderful! I love how it is lit up.....that green bottle looks great! Oh I love all your finds. And those shoe trees are so popular right now. HAve a great week! oh, i forgot to mention the paper dolls. i don't remember having the george washington family, but i had so many & so much fun with them. wish i still had them! Great finds! I love what you did with the paper dolls in the shadow box. I like to play with paper dolls but I don't have any of them from my childhood. Yours look great in your HL shadow box. I wish that I still had my bride and groom paper dolls. I was sort of scissor challenged, so they weren't cut out very well, but I did have endless hours of play with those dolls and outfits. The idea of displaying yours, is really special. What a great idea to put the paper dolls in a shadow box! Very nice way to preserve them. Have a great week! Hi Rhonda...another Rhonda here! What great finds. I love the basket. Putting the light behind it was clever! How fun! I use to play for hours with paper dolls! Rhonda, Had to laugh when you said I could open a pub with all my barware! You haven't seen the other two shelves of wine glasses and the liquor carafes. that are still in boxes... I'm waiting to order the bar! Seriously- I hope to find one at the furniture market in the fall when we go on our buying trip for the store. You had some good finds this week w/the locker basket and the shoe last. I'm a sucker for baskets, wire, wood, or wicker. I think your shadowbox w/your paper dolls is precious. I don't remember the Washingtons at all. I did have some Indian maidens, though. ( I grew up out west...) Thanks for sharing all your pretties. Looks like all your stuff has great memories ! Those are the best finds ! Great finds! Such a pretty bottle hiddent below the wicker! Your transformation turned out lovely! Your laundry room turned out so beautifully...I love all of the little details you highlighed in this post!!! The wicker jug and the wire basket are just 2 of my favorites...wonderful finds!!! Great finds. I absolutely love how you have your paper dolls in the shadow box frame. Wonderful way to showcase and preserve a favorite from your childhood. I love your wire basket! And I'm going to steal your good idea for the paper dolls. I bought an old catalog a few months ago at a yard sale and found Lucy and Desi paper dolls inside! I wasn's sure what to do with them....now I know! Thanks! Love that Angels! We may have passed right by each other and I'm sure I would have looked in you buggy to see what great stuff I missed!! I will have to try out Long Leaf! I know what you mean about Resurrect- such great displays of fascinating stuff! I did a whole post on her store when it first opened in May/early June! Hey Rhonda! I have a blog award for you - so stop by and pick it up to pass it on! I love all your thrifty treasures, such fun! Hey Rhonda, I didn't see an email address, I would email this privately otherwise. I am so in awe of so many of your ideas and inspirations. One of which I would like to copy, and post about. I will give you full credit for the idea, and link you, please let me know if this is alright with you. Some people say Timing is everything. I say Lighting is everything! 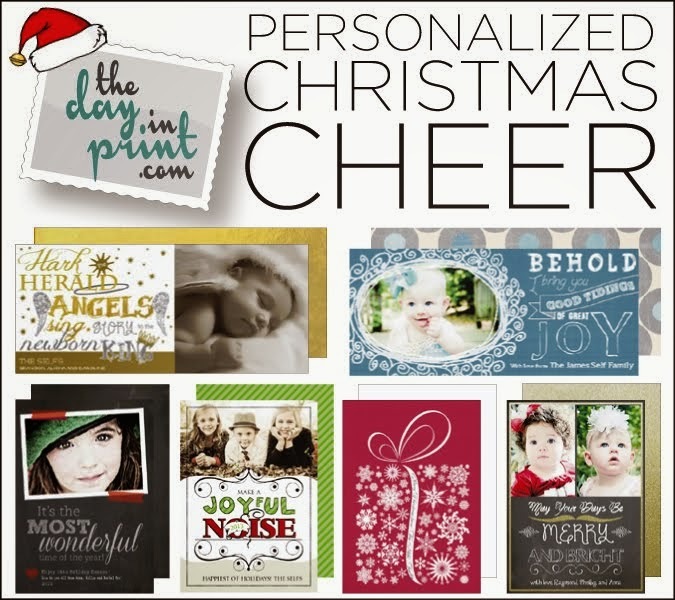 Hello Rhonda - thank you for sharing such great finds! I love the wire baskets and shoe form. That green jug is so neat! Oh, I can't tell you how much I love your idea of putting your paper dolls in a shadowbox! I have all of mine just sitting in a box. I think I want to do this with mine! Love that old locker basket too. I'm still looking for one for myself!